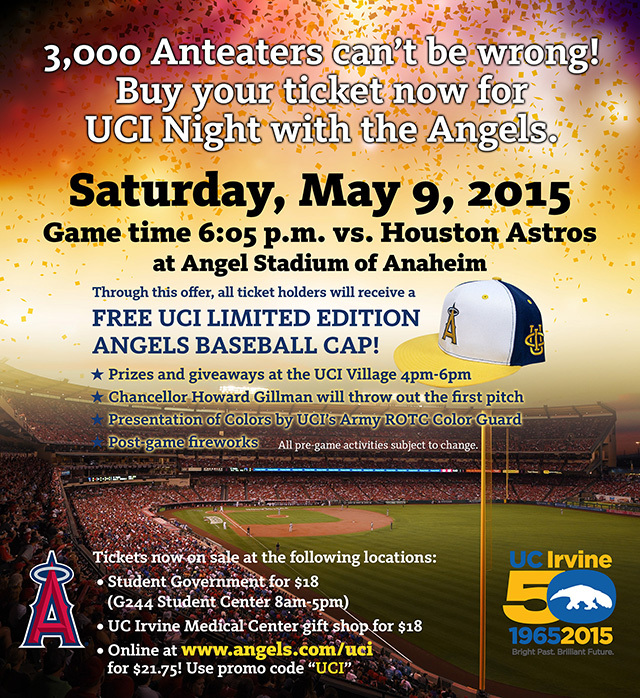 We are excited to announce a special UCI Night with the Angels on Saturday, May 9, at Angel Stadium of Anaheim. The game time is 6:05 p.m., and the Angels will face off against the Houston Astros. This is a night that you and your family won’t want to miss. Due to overwhelming demand, all tickets for this UCI offer have been sold. Some tickets may still be purchased for the game, though the UCI-themed Angels baseball cap will not be part of the deal. Please visit the Angels website for ticket availability. Come check out the UCI Village from 4 p.m. to 6 p.m. inside gate 4 (See location on photo below.). Learn more about UC Irvine, take a selfie at one of our selfie stations, say hi to Peter, or enter to win one of many prizes. 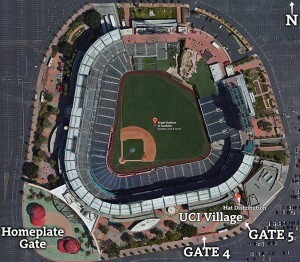 There are three entrances into the Angel Stadium of Anaheim parking lot, via Douglass Road, State College Boulevard and Orangewood Avenue. The parking lot opens two and a half hours prior to the start of the scheduled first pitch. Please follow the directions of the parking staff upon entering the lot. Day of game parking is $10.00 CASH ONLY and oversized vehicles (greater than 20 feet in length) are $20.00. The bus parking lot is located near the Orangewood Avenue entrance. Season ticket holders with parking coupons should use the Express Entry Lane on Orangewood Avenue. We recommend entering the parking lot from Orangewood Avenue and parking on the south side of the stadium, near Gate 4. The hat redemption, UCI Village and seats are all just inside Gate 4. Here are directions to the stadium. There will be a limited number of seats on Anteater Express shuttles to and from the stadium. Please visit this website to reserve your spot on a shuttle. Each shuttle pass will be $5. If you’re interested in carpooling to the game, we encourage you to sign up at www.zimride.com/uci to either find a ride or to offer a spot in your vehicle. Allowed in designated areas only. No outside catering. No alcoholic beverages. No charcoal barbeques; propane barbeques only. Lost tickets can only be replaced if the seat locations are known. The group leader should keep a log of the seat locations issued to individuals in their group. Stolen tickets can only be replaced with a copy of a police report along with exact seat locations. If a group has lost their entire group tickets, $1 per ticket non-refundable replacement fee.